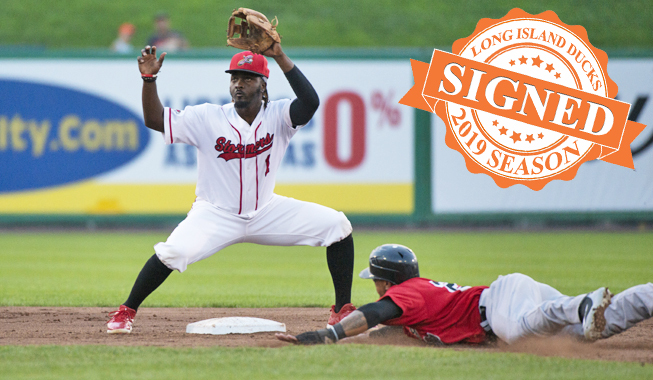 (Central Islip, N.Y., Jan. 29, 2019) – The Long Island Ducks today announced the signing of infielder Vladimir Frias for the 2019 season. Frias was acquired from the Lancaster Barnstormers to complete a previous trade between the clubs. Frias joins the Ducks after earning back-to-back Atlantic League All-Star Game selections with the Barnstormers in 2017 and 2018. In his two seasons with the club, he compiled a .280 batting average with 11 home runs, 69 RBIs, 77 runs scored, 30 doubles, 28 stolen bases and a .350 on-base percentage in 162 games. Defensively, the Dominican Republic native posted a .959 fielding percentage and showcased tremendous range at the shortstop position. The Arizona Diamondbacks purchased Frias’ contract during the 2017 season, and he went on to appear in 35 games combined between Double-A Jackson and Triple-A Reno. Prior to his time in the Atlantic League, the 32-year-old spent time in the San Francisco Giants (2008-09), Boston Red Sox (2010-11, ‘13) and Chicago Cubs organizations (2012). Additionally, he has played two seasons in the Frontier League with the Gateway Grizzlies (2012-13) and three in the American Association with the Kansas City T-Bones (2014-16). While with Kansas City, he recorded 268 hits in 270 games along with 100 RBIs, 133 runs, 39 doubles, 92 walks and 62 stolen bases. Frias was originally drafted by the Giants in the 30th round of the 2008 amateur draft out of Tennessee Wesleyan College. His rights were acquired by Long Island to complete the 2017 trade in which left-handed pitcher Jarret Leverett was sent to Lancaster.